Our guides will demonstrate the basics to ride a horse. See what you'll be able to do! Step onto our mounting block on the left side of your horse then place your left foot into your stirrup and lift your right leg over. Land gently in the seat, so you won’t startle or hurt the horse. Once you mount, we will help you adjust the stirrups for you and make sure that you are comfortable. Point your horses head in the direction you wish to go and squeeze his sides slightly with both of your legs. The right place is just behind the girth. If he doesn’t respond, you will have to squeeze a little harder. This is done by leaning very slightly back and pulling the reins. Be sure you aren’t squeezing with your legs, so you don’t give mixed signals. When you wish to turn left, slightly take your left hand to the left. Give a little bit of slack with your right rein so he doesn’t get confused. When you want to turn right, the aids are mirrored. Trotting is easy, but you shouldn’t progress into faster gaits until you’re confident with your ability to control the horse. When you want the horse to trot, you simply squeeze him with both of your legs. Again, if he doesn’t respond repeat your aids, but make them a little harder. There are two types of trots, the sitting trot and the rising/posting trot. Sitting trot is just sitting in the saddle, but rising trot is quite a bit harder. In rising trot you go up in every second step and on every other step you sit down. Trot is naturally bouncy, so it gives you momentum to get up. 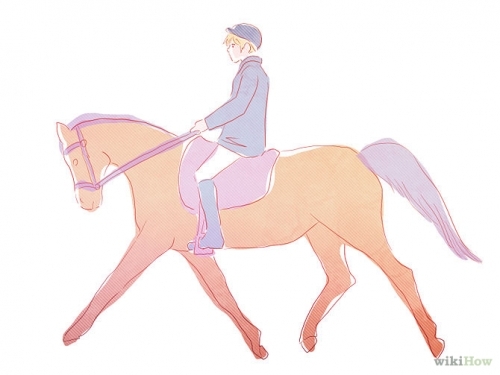 You basically push yourself up with your legs and stand on the stirrups for one step. The pace of the trot is quite fast, so you will basically be going up-down-up-down and so forth. During the ride you will have the opportunity to canter if the trail guide assesses your capable to do so. Cantering is quite a bit faster than the trot, but some think it’s easier to sit in canter than it is in the sitting trot. The aids used to ask for canter are simple, you push your outside leg backward, toward the horse’s rear and put your inside leg slightly more forward from it’s usual place. Then you just squeeze with both of your legs. Note: Cantering is only available for rides for longer than 2 hours or more. Ryders Horse Riding Tours, formerly known as Tonimbuk Trail Rides, has been in operation for more than 4 decades and has taken many locals and tourists on horse riding adventures through Bunyip State Park, south east of Melbourne. © Ryders Horse Riding Tours | Sterling Equine. All rights reserved. Made by Thomas Tuan.